This post contains affiliate links. Affiliate links provide a small commission on products that I like, which keeps this blog running. Thanks for supporting my blog! Story time. As a relatively new step-mom and a fairly new home owner (possibly 300 years ago), I decided to paint the girls’ room. We had three girls with three different favorite colors sharing one very beige room. One wanted an aqua bedroom, one wanted watermelon pink, and one wanted something between a lime and a mint green. We tried to come to a resolution on paint color for weeks with no luck. You’ve got to admire strong willed daughters although perhaps not so much when you are trying to raise them. Of course, I let them each pick a color for one wall, leaving the fourth wall white. I was very new at this parenting thing. I loved color then just as I love color now and was certain it would all turn out fine. Plus, I didn’t have to live in it. I have one word for you to describe the girls' room. Circus. I thought perhaps some matching duvet covers with pink and lime and aqua stripes would help. Nope. It was a disaster. A disaster that lasted maybe two years before I couldn’t take it anymore and repainted the room. I can’t believe it lasted that long. Now, if we could rewind, we would note that NONE of these colors should ever have been used to paint the four walls of a bedroom, but I missed that red flag. (We would also note that any chance you can get as a parent of sibs to not offer fertile ground for an argument, you should take.) What should I have done instead? 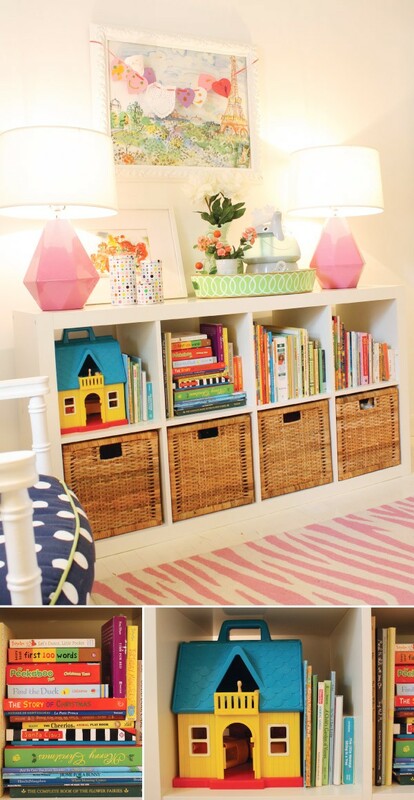 If your children love bright color, go with white walls so that the colors they love show up. This nursery has tons of color but isn’t overwhelming. Note the white walls. Bedding is your friend when it comes to adding color to a kid's room, especially shared kids' rooms. You can pick similar patterns in different, complimentary colors or you can use the same bedding as a base and accessorize with your children’s personal favorites. If there is a color that the kids can agree on (or maybe that you pick), let them pick their own bedding from a palette that works with your paint color. Their bedding doesn’t have to match, but keeping it all in the same palette really helps. Had I gone with white walls and the striped duvet covers in the girls' bedroom, I could have let the girls accessorize their beds and shelves with the color of their choice without creating a circus room that needed to be redone shortly after. You’ve seen it on Pinterest. Whole walls of neatly labeled, clear plastic toy bins. You think to yourself, “Yes! If the toy bins were clear, the kids could see where things go.” The logical progression of this a-ha moment, which you may only get to subconsciously, is that if the kids know where things go, the kids will put things away. Let me let you in on a secret. Kids don’t care what your label says. They are going to put toys away where it is most convenient, if at all. And lids on a box? That’s just one more step between them and playtime. There is a reason the toy box was invented. Open the lid, throw in the toys, close the lid. Simple and done. And it doubles as a seat. If you fear fingers in the lid, or you just can’t stand the fact that all the toys live in the same place, consider open bins or baskets. 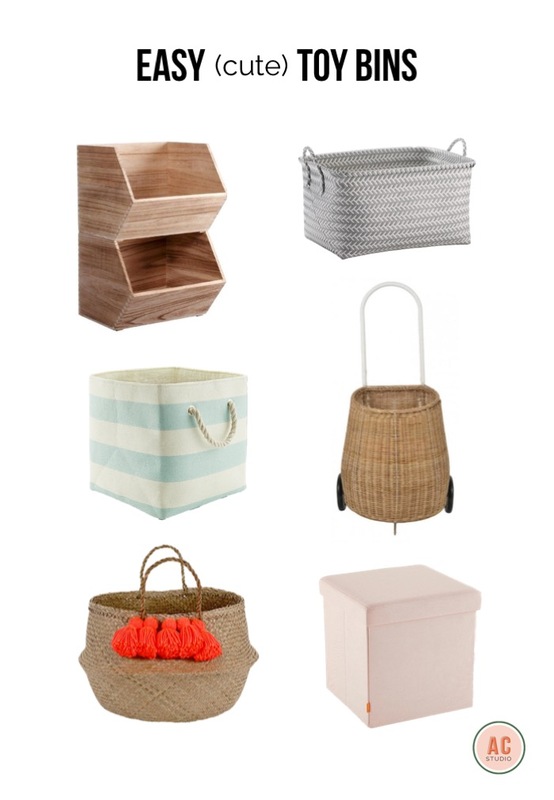 This cute shelf uses baskets that pull out while this impressive wall uses cloth bins (note that this one is slightly impractical as kids are typically not 7’ tall, but it was too beautiful not to include). We all know this one. “Mom! I want a unicorn/soccer/race cars/Frozen room!” You want it done quickly because you don't have time to decorate your kid's bedroom so you buy the sheet set and the poster and the stuffed animal and the rug... Before you know it, it looks like a bag of skittles threw up in your child’s bedroom (see story above). You can do so much better than licensed sheets. Wait. You’ve heard this from me before. Still true. Unless you are Elvis and have room to spare, just say no to themed rooms. Some of you are asking about beach houses in your minds, and yes, the rule applies there as well. 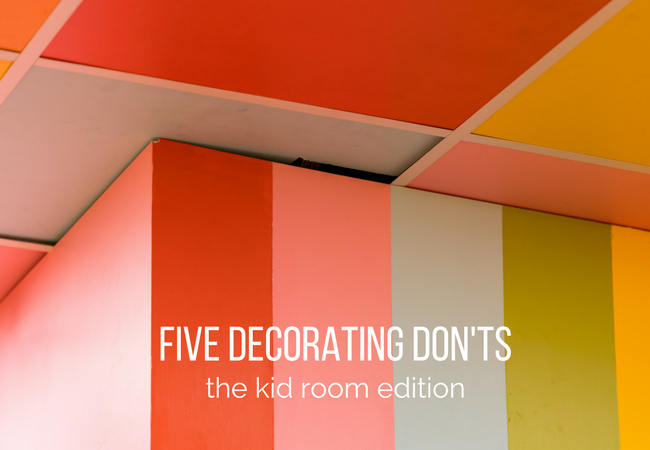 Believe it or not, you can create a room around a child’s favorite pastime/animal/character without looking like you shopped at the Disney store. Children’s interests change quickly and they have no concept of budget. Work with a color palette inspired by your child’s favorite of the moment or add a few accents that reference their current passion. This Star Wars room kills it, as does this one. This shared girls’ room feels beachy without being smothered by a nautical references. Your daughter loves unicorns? 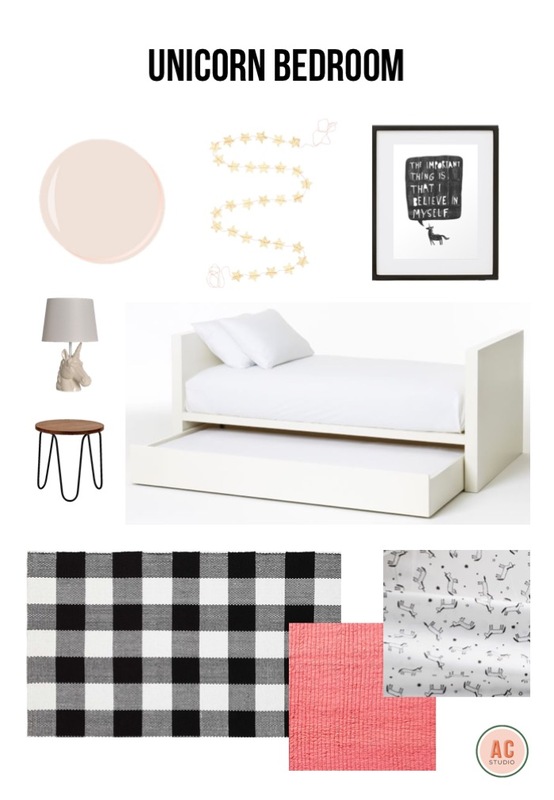 Pick up a cute print, inexpensive lamp, and some sheets, but leave the foundation neutral. When the next “it” animal of the month rolls in, you will be ready. This sounds like a good thing. It is inexpensive, and indeed, it can be super cute. It can also take off your paint if it sticks at all. If you want to add temporary color to boring walls, Lovely Wall Company has some beautiful decals that come in a range of colors and shapes. Feeling a bit more adventurous? Try removable wallpaper (love these stripes and these stars). Nothing says welcome to 2012 like chevron (I dare you to click that link). Buffalo plaid is trendy at the moment. Dots are youthful and seem to never go out of style. Gingham works. You can even go with a classic stripe. Just say no to chevron. That’s all. Need some help with your don'ts? Hit me up here.